The following is an article by local resident Kerryn Loose-Jones. You can add your comments at the bottom of the page. After receiving a response to my letter to Ian Kaye, member for Greenslopes, and attending the Whites Hill State College P&C meeting to listen to Steve Minnikin, Member for Chatsworth (my electorate), talk about the sale of our much loved and used school oval, I feel that we are just going to keep hearing the same thing until sitting members feel the heat of the locals’ unrest! Brisbane is already well behind both Sydney and Melbourne cities with the amount of green space in the inner city areas and the sale of this green space is in contradiction of the Brisbane City Council plan. There is an overland flow of floodwater across the dead centre of the land. If sold to developers, what impact would this have? Long term locals recall the creeks which used to flow around the grounds of the then-Whites Hill State School and Camp Hill State High School. Nearly all of these are now confined as best they can be to inside storm water drains which cannot cope with the large flow in rain events. What will happen to neighbouring properties which already experience flood waters gushing over the roads and sometimes into homes? If the land is developed into town houses or other high to medium density housing as so much of the area is currently, where will the water go? How much would it cost to prevent flooding of the properties? Is now a good time to be selling land for profit? Property prices are at record lows. How will the traffic on Winstanley Rd be affected by high to medium density housing construction on the block? Already traffic is bumper to bumper at peak times, sometimes backed up through the school crossing. This is a huge safety concern for children who catch the bus or walk to school and to all parents accessing the school from this entrance. How will construction noise affect the learning opportunities of our children attending the school? Months of construction could affect a whole year worth of schooling or chances for university entry – imagine nail guns, beeping truck signals, earth moving equipment during year 12 exams, QCS (university entrance) or NAPLAN! Try learning to read in the early years of schooling with banging and crashing from construction work to distract you! What will happen when the demographics of the area cycle again to have more young families and enrolments climb? Our area is getting more and more medium and high density residential zoned streets, which can only increase the number of school aged children in the suburbs. 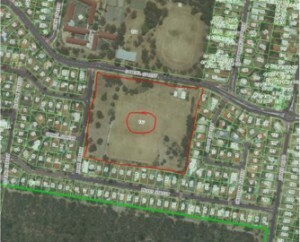 Deputy Mayor and Councillor for the Chandler Ward Adrian Schrinner has said in correspondence that he ‘would be very disappointed to see the sports fields lost’, and that he hopes the State Government ‘have a change of heart’ in regards to the sale of the oval, while Steve Minnikin MP for Chatsworth has said he cannot support that view. A group of almost 70 locals met last Friday night to find out more about the sale and express their concerns. From this meeting the Save Whites Hill State College Oval community action group has emerged. If you are interested in joining us in the fight to keep our school oval, please contact me at kerryncommunityaction@gmail.com, visit our blog and you can also find us on Facebook ‘Save Whites Hill State College Oval’ group. Most importantly please sign our petition and contact your local member to let them know how you feel about our school land being sold! Kerryn is a mum to a current Whites Hill State College student and two future WHSC students, sister of a past Camp Hill State High School student and daughter of a foundation year 1 student of Whites Hill Primary School. Add your comments and questions below! I maintain this oval is rarely used. To say otherwise is simply to misrepresent the facts. As a local, every day I drive past this oval at least 4 times – weekdays and weekends, day and night, and have done so for many years – not just for the very short length of time that you have spent putting up your visual pollution. This oval is not open to the public. Signs are erected on the oval fences on two sides indicating that use of the oval requires authorisation by the school. Without school approval, public use of the oval is not permitted. The oval itself is often boggy. Considerable and costly works and ongoing maintenance will be required to bring the oval up to standard suggested for its future potential use and to maintain it that way. These costs will be passed onto users. Sporting costs are already prohibitive for many cash-strapped parents and further costs will simply divert children and their parents from active sport participation. In addition, increased usage of this oval at all times of the day (and night) will interrupt the lives of our local residents. Night lights, as you suggest, may well be an unwelcome intrusion. How will the sugar gliders feel about this being nocturnal? Where will oval users park? Where will school parents park? What about the increased traffic that will result? What about the safety of our children travelling to and from school? To oppose this matter without thought to the pros and cons is foolish. Every resident has the right to state their opinion and should do so. The sale and development of the oval will enable measures to be put in place to alleviate water flow issues that current adversely impact locals and enable effective traffic management to be put in place to address increased flow. I suggest that most of this electorate actually supports this sale and will continue to do so provided local residents and relevant stakeholders are consulted and kept well-informed, based on fact – not emotion. Thankfully, this is the job of our elected Government officials. I am a mother of 3 children, all of whom attend or have attended Whites Hill State College. I am also a local resident who has lived in the area for over 20 years. I have witnessed many changes in our local community – both good and bad. The fact is – the WHSC oval is rarely used. Other than weekly Wednesday afternoon interschool sport held during the school term, if you drive past the oval on any day of the week you will be hard pushed to see even one person enjoying this greenspace. Had the previous school administration been proactive in identifying strategies to capitalise on the income-earning potential of this valuable asset years ago, then perhaps the Government may well have realised an adequate return on its investment, and thus, looked elsewhere for asset sale revenue today. However, the harsh reality is that given current economic circumstances, any commercially-focused government would and should consider the sale of its under-performing, under-utilised non-revenue generating assets. While it may be a corridor for sugar gliders which, of course, must be protected, there are conditions that can be imposed on the sale, development and use of land, to protect and preserve fauna and flora. Environmental and construction concerns can be managed as part of the planning, approval and development processes. Traffic and existing water flow issues can be addressed similarly. To my knowledge, no site master plan has ever been developed for the school site. What will WHSC look like in 5 to 10 years? What will it look like in 20 or 30 years? A lack of future-proof planning makes discussion of schooling requirements in the years to come a purely speculative exercise. The site does not necessarily have to accommodate residential property development. Some “out of the box” thinking could identify options to explore. For example, given Whites Hill State College is distinguishing itself as an International School, the land could be developed to construct a separate international college affiliated with the college, with dormitory style accommodation on-site. It could be jointly funded by Government and international users and landscaped in such a way as to preserve the gliders’ corridor and attract other wildlife to the area. Realisation of such an initiative, while initially a significant outlay, could generate long-term revenue streams for both the Government and the school. It could create jobs and contribute to the growth of our local economy, our small businesses and our community generally. It could improve the reputation of WHSC and Queensland as an education service provider and create positive impacts for residents in terms of improved waterflow and traffic management. The relocation of the international school from the existing school campus could free up space to accommodate any future WHSC enrolment growth so benefits are likely to be realised. For the record, I am not opposed to the sale of this oval and I support its future development for the benefit of our community What citizens must do if they are truly opposed to this sale is convince Government that other commercially-viable alternatives exist. Rejection of this sale out of hand is unlikely to halt its progress. The growth in families in the local area over the past 20 to 30 year has been huge. With ongoing pressures on the existing schools in the area, selling off areas within existing schools mean that in the future the opportunities for upgraded and increase school facilities will be reduced. It is ridiculous to reduce local school facilities. Losing this open space will decrease the amenity of the school as well as the facilities and open for active leaning and sports. The whole school site is also an important habitat linkage to the creek connection to Bulimba creek and the Whites Hill reserve. I live on Jones Rd next to Whites Hill, A flyer was placed in my letter box on the Friday the day of the meeting.I am disgusted that this important Corridor for Sugar Gliders will be sold off by the Government. If this proceeds I will cover the area with posters of Dead Sugar gliders and the names of the Premier and the local Member will appear on them in bold print from now and upto the next election. I have emailed the Premier and the member and The ministers of the Government. I will tell every person I know of what is occuring.